Princess Thanya and her 6-year-old daughter made a darling craft using some inexpensive items. Do you have hidden candy? Or are you like me and can’t pass up candy marked 50-70% off? Well my daughter and I had fun making this today for her teacher, but it would make a perfect gift for anyone! It took us less than 20 minutes, and she had so much fun making something for someone she cares about that we made another one for the school nurse. Bag of mini chocolate bars. We used 3 Musketeers that is Easter clearance candy, but just about any candy would work. Glue gun – Supervise children with a glue gun! Well, lets see the skewers I had but a bag will cost around a buck, and the glue gun I had but the mini ones are under $10. 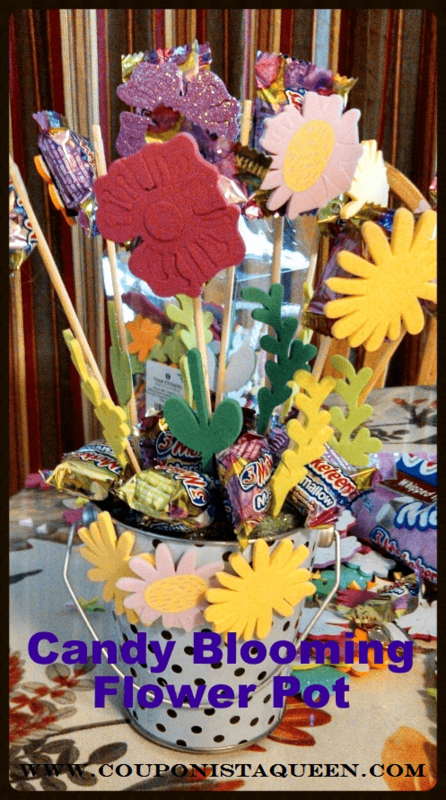 I spent $1.50 on the candy, and the big box of flower foam shapes was $5 and 70% off today at Target making them $1.50 and I have bunches left over for future crafts. I have also seen these in smaller packages at the Dollar Tree. The metal pail was $1 in the Target $1 bin area but it was black dot for 70% off so this was only 30 cents! The green foam is $1 at the Dollar Tree and you can get enough for 2-3 for 99 cents. So I spent under $7 and I have enough to make 3 little gifts, so $2.33 each and you can snack on chocolates while you make it. But really you can use what you have on hand. Pencils work well…or do you have popsicle sticks in your craft box? Once I cut the foam to fit the pail, we secured it with glue and then started the flowers. Glue on one side, for the flower, the other for the stick and in the middle if you have leaves…VIOLA! My daughter is super excited to share and brighten her teacher’s and school nurse’s day on Monday and I’m happy that I won’t have the candy to side track my Weight Watcher’s plan lol. But mainly I’m happy that we had a nice time making something for someone else.